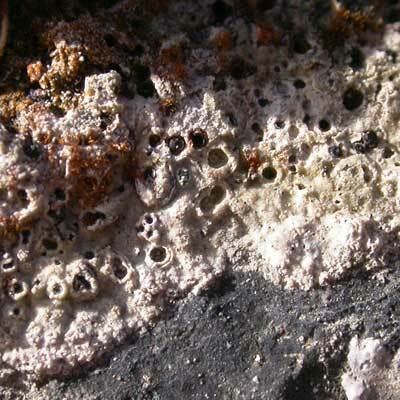 This crustose calcicole inhabits a similar niche to Gyalecta jenensis on shaded, naturally occurring, vertical, limestone rock. The K-, cracked thallus is highly conspicuous in its white colour and densely frosted (pruinose) surface. The deeply concave discs (2-5mm diam.) are frequent. Well recorded in the Burren (County Clare) but rather rare throughout rest of Ireland. Thallus K-; discs concave, often with Gyalecta jenensis. Simms, M. J., (2016). Diploschistes gypsaceus (Ach.) Zahlbr.. [In] LichenIreland.